Vietnam Airlines (VN) (www.vietnamairlines.com) operates daily flights between Hanoi, Ho Chi Minh City, Hué, Danang and Nha Trang. Jetstar Pacific (www.jetstar.com) also operate flights on these routes. Regular services are also provided by Vietnam Airlines between Hanoi and Ho Chi Minh City to Buon Ma Thuot, Dalat, Phu Quoc, Pleiku and Qui Nhon. The road situation has improved dramatically so flights are used for long distances and to save time. It is still easier to fly to places like Dien Bien Phu. Flights are particularly busy around the Tet holiday in January/February and it is essential to book ahead. The road network throughout Vietnam is reasonable but the standard of the roads varies dramatically from good to appalling. Road conditions can deteriorate during the rainy season. Roads throughout Vietnam are designated by numbers and the main north to south route is Highway 1 connecting Hanoi with Ho Chi Minh City. 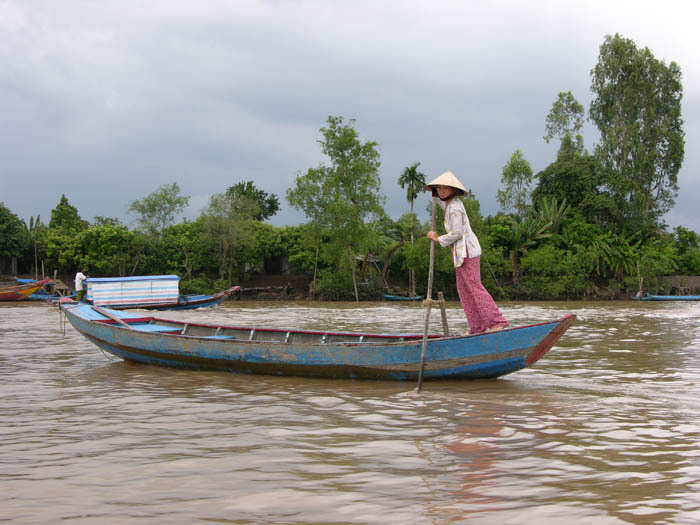 Highway 1 travels the length of the country from the very south to Hanoi via Danang and Hue. The road from Ho Chi Minh City to the Cambodian border is Highway 22. It is possible to hire chauffeur-driven cars from travel companies. Self-drive car hire is non-existent. Taxis are plentiful and cheap. They can be flagged down on the street or arranged through your hotel or the restaurant where you are eating. Always make sure the driver has set the meter before starting the journey. Bicycles can be hired for a day or longer from shops in the main towns and cities. Many Vietnamese people still have a bicycle as their main form of transport but now there are many more motorbikes as well as cars and lorries. Particular care must be taken when cycling in towns and on main roads outside the towns as drivers do not always observe road rules and are not cyclist-aware. Long-distance coaches operate throughout the country, between Hanoi, Hué, Danang and Ho Chi Minh City. Tickets must be bought in person at the bus station. Seat belts are not compulsory in Vietnam. Helmets are compulsory for motorbike riders. Cars drive on the right. An International Driving Permit and a test (taken in Vietnam) are required for long-term residents. There are local bus services in Ho Chi Minh City and in Hanoi. It is also possible to travel by taxi, motorbike or cyclo (cycle rickshaw; motorised version also exists). Most foreigners forego the bus, preferring to use these. Taxi drivers do not expect to be tipped, but it is welcomed. Hopping on the back of a ‘moto’ is the cheapest way to travel, if you have the stomach for the crazy driving. Agree the price first and make sure they have a good helmet. Visitors may use the rail transport system independently or as part of a rail tour. Express long-distance trains are faster than local services, more reliable and more comfortable. Although a few carriages now have air conditioning, facilities are still short of international standards. The main rail route connects Hanoi and Ho Chi Minh City and the journey can take between 30 and 40 hours. 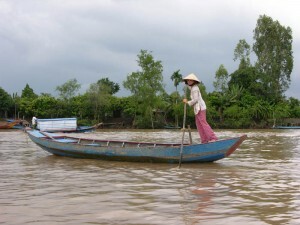 There are also services from Hanoi to Haiphong, Dong Dang and Lao Cai. Contact Vietnam Railways (tel: (04) 3942 3949; www.vr.com.vn) for more information. Tickets should be bought at railway stations. There are private tourist carriages attached to long-distance trains on the Hanoi to Danang (tel: (04) 3942 9919; www.livitrans.com) and Hanoi to Sapa routes (tel: (20) 387 1522;www.victoriahotels-asia.com; also served by Livitrans) where the standard is higher and there is a dining car. Cat Ba Island, in the north, is a popular place for visitors and can be reached by hydrofoil from Haiphong. The tropical getaway island of Phu Quoc in the Gulf of Thailand can be reached by hydrofoil from Rach Gia in the Mekong Delta.